In addition to 50,000 new well-paying, knowledge-sector jobs, a new Amazon headquarters in Toronto would bolster local talent and encourage other companies to follow suite, proponents of the project suggest. But Amazon HQ2 would also have a much more immediate effect: Markedly change the perception in the United States of Canada and the Toronto area, according to Toronto Global CEO Toby Lennox. However, Toronto is heading in that direction, with or without Amazon. Its physical presence in the area would be more of a bonus, Lennox says. “They’re going to be joining a party that’s already underway,” he explains. 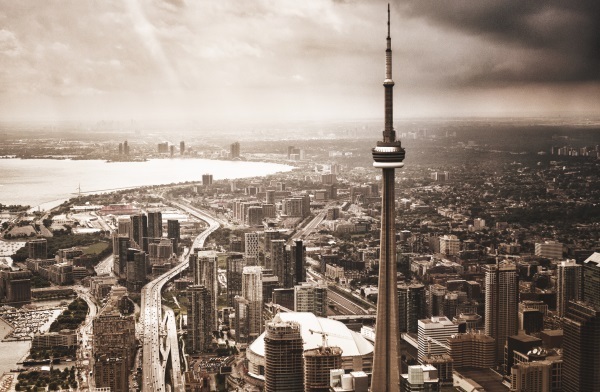 Amazon HQ2 would have an immediate effect: Markedly change the perception in the United States of Canada and the Toronto area, according to Toronto Global CEO Toby Lennox. Jay Shah agrees. The director of the Velocity entrepreneur program at the University of Waterloo says the bustling tech innovation corridor has shown great promise over the past several years, and pointed to the university’s existing partnership with Amazon from a research capacity in artificial intelligence. HQ2 would shed even more light on that research and the talent behind it. Additional companies would turn to the corridor as a place to set up shop. “It would create a bit of a snowball effect and attract more talent and employers to the area,” Shah says. The 800-pound gorilla, as he describes, can coexist with the Toronto area’s existing innovation community, the same way big names in Silicon Valley operate a short distance away from smaller companies looking to grow. Google’s office in the Waterloo Region has seen tremendous growth since 2005, Shah says, and while the scenario is significantly different in terms of scale compared to Amazon’s HQ2, people’s assumption that the tech giant would outpay jobs and gobble up talent didn’t happen. “Certainly they raised the bar for competition, but they also drew talent to the region that wouldn’t have come otherwise,” he explains. In a recent article for Business Insider, Karen Greve Young, vice-president of corporate development and partnerships for MaRS, said Amazon would compound the current growth Toronto’s tech sector is experiencing. The city added 22,500 new tech jobs in the last two years, which is more than New York City and Silicon Valley combined. However, it’s important people realize that Toronto’s RFP is gaining attention from many companies, Lennox says. The document has been downloaded 11,000 times. “We don’t need Amazon for our civic transformation,” he says. Toronto Mayor John Tory also expressed his support for the project at a press conference recently. The debate about #AmazonHQ2 in Toronto – good for the city https://t.co/nXz9TdUmFf – or bad for the city? https://t.co/K1vcO3mGSr What's your take? What do you think? Make your case for Amazon HQ2 being good or bad for Toronto and Canada in the comments section below. Or tweet us @itworldca.